Fraunce (France French: [fʁɑ̃s]), offeecially the French Republic (République française [ʁepyblik fʁɑ̃sɛz]), is a kintra wi territory in wastren Europe an several owerseas regions an territories. [upper-roman 15] The European, or metropolitan, aurie o Fraunce extends frae the Mediterranean Sea tae the Inglis Channel an the North Sea, an frae the Rhine tae the Atlantic Ocean. Owerseas Fraunce include French Guiana on the Sooth American continent an several island territories in the Atlantic, Pacific an Indie oceans. Fraunce spans 643,801 square kilometres (248,573 sq mi) an haed a tot population o awmaist 67 million fowk as o Januar 2017. It is a unitary semi-presidential republic wi the caipital in Paris, the kintra's lairgest ceety an main cultural an commercial centre. Ither major urban centres include Marseille[upper-roman 16], Lyon, Lille, Nice, Toulouse an Bordeaux. In the Airn Age, whit is nou metropolitan Fraunce wis inhaibitit bi the Gauls, a Celtic fowk. The aurie wis annexed in 51 BC bi Roum, which held Gaul till 486, when the Germanic Franks conquered the region an formed the Kinrick o Fraunce. Fraunce emerged as a major European pouer in the Late Middle Ages, wi its veectory in the Hunder Years' War (1337 tae 1453) strenthenin state-biggin an poleetical centralisation. During the Renaissance, French cultur flourished and a global colonial empire wis established, which bi the 20t century wad be the seicont lairgest in the warld. The 16t century wis dominatit bi releegious ceevil wars atween Catholics an Protestants (Huguenots). Fraunce acame Europe's dominant cultural, poleetical, an militar power unner Louis XIV. In the late 18t century, the French Revolution owerthrew the absolute monarchy, established ane o modren history's earliest republics, an saw the draftin o the Declaration o the Richts o Man an o the Ceetizen, which expresses the naition's ideals tae this day. In the 19t century Napoleon teuk pouer an established the First French Empire, whase subsequent Napoleonic Wars shaped the coorse o continental Europe. Follaein the collapse o the Empire, Fraunce endured a tumultuous succession o govrenments culminatin wi the establishment o the French Third Republic in 1870. Fraunce wis a major pairteecipant in the First Warld War, frae which it emerged victorious, an wis ane o the Allied Pouers in the Seicont Warld War, but came unner occupation bi the Axis Pouers in 1940. Follaein leeberation in 1944, a Fowert Republic wis established an later dissolved in the coorse o the Algerian War. The Fift Republic, led bi Charles de Gaulle, wis formed in 1958 an remeens tae this day. Algerie an nearly aw the ither colonies acame independent in the 1960s wi minimal controversy an teepically reteened close economic an militar connections wi Fraunce. Fraunce haes lang been a global centre o airt, science, an filosofie. It hosts Europe's fowerth-lairgest nummer o cultural UNESCO Warld Heritage Steids an receives aroond 83 million foreign tourists annually, the maist o ony kintra in the warld. Fraunce is a developit kintra wi the warld's saxt-lairgest economy bi nominal GDP an nint-lairgest bi purchasin pouer parity. In terms o aggregate hoosehauld wealth, it ranks fowert in the warld. Fraunce performs well in internaitional rankins o eddication, heal care, life expectancy, an human development. Fraunce remeens a great pouer in the warld, bein ane o the five permanent members o the Unitit Naitions Security Cooncil wi the pouer tae veto an an offeecial nuclear-wappen state. It's a leadin member state o the European Union an the Eurozone. It is an aa a member o the Group o 7, North Atlantic Treaty Organization (NATO), Organisation for Economic Co-operation an Development (OECD), the Warld Tred Organisation (WTO), an La Francophonie. Oreeginally applee'd tae the whole Frankish Empire, the name "Fraunce" comes frae the Laitin Francia, or "kintra o the Franks". Modren Fraunce is still named the day Francia in Italian an Spaingie, Frankreich in German an Frankrijk in Dutch, aw o which hae the same historical meanin. Thare are various theories as tae the origin o the name Frank. Follaein the precedents o Edward Gibbon an Jacob Grimm, the name o the Franks haes been airtit wi the wird frank (free) in Inglis. It haes been suggestit that the meanin o "free" wis adoptit acause, efter the conquest o Gaul, anerly Franks war free o taxation. Anither theory is that it is derived frae the Proto-Germanic wird frankon, which translates as javelin or lance as the thrawin axe o the Franks wis kent as a francisca. Houever, it haes been determined that thir wappens war named acause o thair uise bi the Franks, nae the ither wey aroond. In 600 BC, Ionie Greeks, oreeginatin frae Phocaea, foondit the colony o Massalia (present-day Marseille), on the shores o the Mediterranean Sea. This maks it Fraunce's auldest ceety. At the same time, some Gallic Celtic tribes penetratit pairts o the current territory o Fraunce, an this occupation spread tae the rest o Fraunce atween the 5t an 3rd century BC. The concept o Gaul emerged at that time; it corresponds tae the territories o Celtic settlement rangin atween the Rhine, the Atlantic Ocean, the Pyrenees an the Mediterranean. Aroond 125 BC, the sooth o Gaul wis conquered bi the Romans, wha cried this region Provincia Nostra ("Oor Province"), which ower time evolved intae the name Provence in French. Julius Caesar conquered the remainder o Gaul an owercame a revolt carried oot bi the Gallic chieftain Vercingetorix in 52 BC. Gaul wis dividit bi Augustus intae Roman provinces. Mony ceeties war foondit during the Gallo-Roman period, includin Lugdunum (present-day Lyon), which is conseedert the caipital o the Gauls. Frae the 250s tae the 280s AD, Roman Gaul suffered a serious crisis wi its fortified borders bein attacked on several occasions bi barbarians. Nivertheless, the situation improved in the first hauf o the 4t century, which wis a period o revival an prosperity for Roman Gaul. In 312, the emperor Constantin I convertit tae Christianity. Subsequently, Christians, wha haed been persecutit till then, increased rapidly athort the entire Roman Empire. But, frae the beginnin o the 5t century, the Barbarian Invasions resumed, an Germanic tribes, sic as the Vandals, Suebi an Alans crossed the Rhine an settled in Gaul, Spain an ither pairts o the collapsin Roman Empire. At the end o the Antiquity period, auncient Gaul wis dividit intae several Germanic kinricks an a remeenin Gallo-Roman territory, kent as the Kinrick o Syagrius. Simultaneously, Celtic Britons, fleein the Anglo-Saxon settlement o Breetain, settled the wastren pairt o Armorica. As a result, the Armorican peninsula wis renamed Brittany, Celtic cultur wis revived an independent petty kinricks arose in this region. The pagan Franks, frae that the auncient name o "Francie" wis derived, oreeginally settled the north pairt o Gaul, but unner Clovis I conquered maist o the ither kinricks in northren an central Gaul. The Franks embraced the Christian Gallo-Roman cultur an auncient Gaul wis eventually renamed Francia ("Laund o the Franks"). The Germanic Franks adoptit Romanic leids, except in northren Gaul whaur Roman settlements war less dense an whaur Germanic leids emerged. Clovis made Paris his caipital an established the Merovingian dynasty, but his kinrick wad nae survive his daith. The Franks treatit laund purely as a private possession an dividit it amang thair heirs, sae fower kinricks emerged frae Clovis's: Paris, Orléans, Soissons, an Rheims. The last Merovingian keengs lost pouer tae thair mayors o the palace (heid o hoosehauld). Ane mayor o the palace, Charles Martel, defeatit an Islamic invasion o Gaul at the Battle o Tours (732) an earned respect an pouer within the Frankish kinricks. His son, Pepin the Short, seized the croun o Francie frae the waikened Merovingians an foondit the Carolingian dynasty. Pepin's son, Charlemagne, reunitit the Frankish kinricks an biggit a vast empire athort Wastren an Central Europe. Proclaimed Haly Roman Emperor bi Pape Leo III an sicweys establishin in earnest the French govrenment's langtime historical association wi the Catholic Kirk, Charlemagne tried tae revive the Wastren Roman Empire an its cultural grandeur. Charlemagne's son, Louis I (emperor 814–840), keepit the empire unitit; houiver, this Carolingian Empire wad nae survive his daith. In 843, unner the Treaty o Verdun, the empire wis dividit atween Louis' three sons, wi East Francia gangin tae Louis the German, Middle Francia tae Lothair I, an Wast Francia tae Charles the Bald. Wast Francia approximatit the aurie occupied bi, an wis the precursor, tae modren Fraunce. The Carolingian dynasty ruled Fraunce till 987, when Hugh Capet, Duke o Fraunce an Coont o Paris, wis crouned Keeng o the Franks. His stryndants—the Capetians, the Hoose o Valois, an the Hoose o Bourbon—progressively unified the kintra throu wars an dynastic inheritance intae the Kinrick o Fraunce, which wis fully declared in 1190 bi Philip II Augustus. Lik the rest o Europe, Fraunce wis struck bi the Black Daith; hauf o the 17 million population o Fraunce dee'd. The French Renaissance saw a spectacular cultural development an the first staundartisation o the French leid, which wad acome the offeecial leid o Fraunce an the leid o Europe's aristocracy. French explorers, sic as Jacques Cartier or Samuel de Champlain, claimed lands in the Americas for Fraunce, pavin the wey for the expansion o the First French colonial empire. The rise o Protestantism in Europe led Fraunce tae a ceevil war kent as the French Wars o Releegion, whaur, in the maist notorious incident, thoosands o Huguenots war murthert in the St. Bartholomew's Day massacre o 1572. The Wars o Releegion war endit bi Henry IV's Edict o Nantes, which granted some freedom o releegion tae the Huguenots. The monarchy reached its peak during the 17t century an the reign o Louis XIV. Fraunce obteened mony owerseas possessions in Americae, Africae an Asie. Louis XIV. amang mony things, revoked the Edict o Nantes, forcin thoosands o Huguenots intae exile. Unner Louis XV, Louis XIV's grandson, Fraunce lost New Fraunce an maist o its Indie possessions efter its defeat in the Seiven Years' War, which endit in 1763. An unpopular keeng, Louis XV's waik rule, his ill-advised financial, poleetical an militar deceesions – as well as the debauchery o his coort– discreditit the monarchy, which arguably paved the wey for the French Revolution 15 years efter his daith. Facin financial truibles, Louis XVI summoned the Estates-General (gatherin the three Estates o the realm) in Mey 1789 tae propose solutions tae his govrenment. As it came tae an impasse, the representatives o the Third Estate formed intae a Naitional Assembly, signallin the ootbreak o the French Revolution. Fearin that the keeng wad suppress the newly creatit Naitional Assembly, insurgents stormed the Bastille on 14 Julie 1789, a date which wad acome Fraunce's Naitional Day. The absolute monarchy wis subsequently replaced bi a constitutional monarchy. While Louis XVI, as a constitutional keeng, enjoyed popularity amang the population, his disastrous flicht tae Varennes seemed tae juistify rumours he haed tied his howps o poleetical salvation tae the prospects o foreign invasion. His credibility wis sae deeply unnermined that the aboleetion o the monarchy an establishment o a republic acame an increasin possibeelity. Louis XVI wis convictit o traison an guillotined in 1793. Facin increasin pressur frae European monarchies, internal guerrilla wars an coonterrevolutions (sic as the War in the Vendée), the young Republic fell intae the Reign o Terror. Atween 1793 an 1794, atween 16,000 an 40,000 fowk war executit. In Wastren Fraunce, the ceevil war atween the Bleus ("Blues", supporters o the Revolution) an the Blancs ("Whites", supporters o the Monarchy) lastit frae 1793 tae 1796 an led tae the loss o atween 200,000 an 450,000 lives. Baith foreign airmies an French coonter-revolutionaries war crushed an the French Republic survived. Efter a short-lived govrenmental scheme, Napoleon Bonaparte seized control o the Republic in 1799 acomin First Consul an later Emperor o the French Empire (1804–1814/1815). As a continuation o the wars sparked bi the European monarchies against the French Republic, chyngin sets o European Coaleetions declared wars on Napoleon's Empire. His airmies conquered maist o continental Europe wi swift victories sic as the battles o Jena-Auerstadt or Austerlitz. He redrew the European poleetical cairt, while members o the Bonaparte faimily war appyntit as monarchs in some o the newly established kinricks. Thir victories led tae the warldwide expansion o French revolutionary ideals an reforms, sic as the Metric seestem, the Napoleonic Code an the Declaration o the Richts o Man. Efter the catastrophic Roushie campaign, an the ensuin uprisin o European monarchies against his rule, Napoleon wis defeatit an the Bourbon monarchy restored. Aboot a million Frenchmen died during the Napoleonic Wars. Efter his brief return frae exile, Napoleon wis feenally defeatit in 1815 at the Battle o Waterloo, the monarchy wis re-established (1815–1830), wi new constitutional leemitations. The discreditit Bourbon dynasty wis owerthrawn bi the Julie Revolution o 1830, which established the constitutional Julie Monarchy, which lastit till 1848, when the French Seicont Republic wis proclaimed, in the wake o the European Revolutions o 1848. In 1852, the preses o the French Republic, Louis-Napoléon Bonaparte, Napoleon I's neffae, wis proclaimed emperor o the seicont Empire, as Napoleon III. Napoleon III wis unseatit follaein defeat in the Franco-Proushie War o 1870 an his regime wis replaced bi the Third Republic. Fraunce wis a member o the Triple Entente when Warld War I broke oot. A smaw pairt o Northren Fraunce wis occupied, but Fraunce an its allies emerged victorious against the Central Pouers at a tremendous human an material cost. Warld War I left 1.4 million French sodgers deid, 4% o its population. In 1940 Fraunce wis invadit an occupied bi Nazi Germany. Metropolitan Fraunce wis dividit intae a German occupation zone in the north an Vichy Fraunce, a newly established authoritarian regime collaboratin wi Germany, in the sooth, while Free Fraunce, the govrenment-in-exile led bi Charles de Gaulle, wis set up in Lunnon. Frae 1942 tae 1944, aboot 160,000 French ceetizens, includin aroond 75,000 Jews, war deportit tae daith camps an concentration camps in Germany an Poland. On 6 Juin 1944 the Allies invaded Normandy an in August thay invadit Provence. Ower the follaein year the Allies an the French Resistance emerged victorious ower the Axis pouers an French sovereignty wis restored wi the establishment o the Proveesional Govrenment o the French Republic (GPRF). The GPRF laid the grundwark for a new constitutional order that resultit in the Fowert Republic, which saw spectacular economic growthe (les Trente Glorieuses). Fraunce wis ane o the foondin members o NATO (1949). Fraunce attemptit tae regain control o French Indocheenae but wis defeatit bi the Viet Minh in 1954 at the climactic Battle o Dien Bien Phu. Anerly months later, Fraunce faced anither anti-colonialist conflict in Algerie. Tortur and illegal executions war perpetratit bi baith sides an the debate ower whether or nae tae keep control o Algerie, then hame tae ower ane million European settlers, wracked the kintra an nearly led tae a coup an ceevil war. In 1958, the waik an unstable Fowert Republic gae wey tae the Fift Republic, which includit a strenthened Presidency. In the latter role, Charles de Gaulle managed tae keep the kintra thegether while takin steps tae end the war. The Algerie War wis concludit wi the Évian Accords in 1962 that led tae Algerie unthirldom. In the context o the Cauld War, de Gaulle pursued a policy o "naitional unthirldom" taewart the Wastren an Eastren blocs. Tae this end, he widrew frae NATO's militar integratit command, he launched a nuclear development programme an made Fraunce the fowert nuclear pouer. Syne the 1995 Paris Métro an RER bombins, Fraunce haes been sporadically targetit bi Islamist organisations, notably the Charlie Hebdo attack in Januar 2015 which provoked the lairgest public rallies in French history, gatherin 4.4 million fowk, the November 2015 Paris attacks which resultit in 130 daiths, the deidliest attack on French sile syne Warld War II, an the deidliest in the European Union syne the Madrid train bombins in 2004 an the 2016 Nice attack which caused 87 daiths during Bastille Day celebrations. The European pairt o Fraunce is cried Metropolitan Fraunce an it is locatit in ane o the occidental ends o Europe. It is bordered bi the North Sea in the north, the Inglis Channel in the northwast, the Atlantic Ocean in the wast an the Mediterranean sea in the sootheast. It borders Belgium an Luxembourg in the northeast, Germany and Swisserland in the east, Italy an Monaco in the sootheast, an Spain an Andorra in the sooth an soothwast. The borders in the sooth an in the east o the kintra are moontain ranges: the Pyrenees, the Alps an the Jura, the mairch in the east is frae the Rhine river, while the mairch in the north an the northeast melts in na naitural elements. In Sooth Americae: French Guiana. In the Atlantic Ocean: Saunt Pierre an Miquelon an, in the Antilles: Guadeloupe, Martinique, Saunt Martin an Saunt Barthélemy. In the Paceefic Ocean: French Polynesie, the special collectivity o New Caledon, Wallis an Futuna an Clipperton Island. In the Indie Ocean: Réunion island, Mayotte, Scaitert Islands in the Indie Ocean, Crozet Islands, St. Paul an Amsterdam islands. In the Indie Ocean: Kerguelen Islands. In the Antarctic: Adélie Land. Fraunce haes laund borders wi Brazil an Suriname in French Guiana an wi the Kinrick o the Netherlands throu the French pairt o Saunt Martin. At 4,810.45 metres (15,782 ft) abuin sea level, the heichest pynt in Wastren Europe, Mont Blanc, is situatit in the Alps on the French an Italian border. Fraunce an aa haes extensive river seestems sic as the Seine, the Loire, the Garonne, an the Rhone, which divides the Massif Central frae the Alps an flows intae the Mediterranean Sea at the Camargue. Corsica lies off the Mediterranean coast. Maist o the law-lyin auries o metropolitan Fraunce excludin Corsica are locatit in the oceanic climate zone, Cfb, Cwb an Cfc in the Köppen clessification. A smaw pairt o the territory borderin the mediterranean basin lies in the Csa an Csb zones. Fraunce wis ane o the first kintras tae creaut an environment meenistry, in 1971. Awtho it is ane o the maist industrialised kintras in the warld, Fraunce is ranked anerly 17t bi carbon dioxide emeessions, behind less populous naitions sic as Canadae or Australie. This is acause Fraunce decidit tae invest in nuclear pouer follaein the 1973 ile crisis, which nou accoonts for 75% o its electricity production an results in less pollution. Forests accoont for 28% o Fraunce's laund aurie, an are some o the maist diverse in Europe, comprisin mair nor 140 species o trees. Thare are nine naitional pairks an 46 naitural pairks in France. ↑ For information aboot regional leids see Leids o Fraunce. ↑ Established the Kinrick o the Wast Franks (the Kinrick o Fraunce) frae the Carolingian Empire o Francie. ↑ European Union syne 1993. ↑ Includin aw the owerseas depairtments. ↑ French Naitional Geografic Institute data, which includes bouks o watter. ↑ French Laund Register data, which exclude lochs, ponds an glaciers lairger nor 1 km² (0.386 sq mi or 247 acres) as well as the estuaries o rivers. ↑ Metropolitan Fraunce anly. The population density for the whole territory o the French Republic (includin aw owerseas départements) is 103.49099/km2 (268.04043/sq mi). ↑ Whole o the French Republic except the owerseas territories in the Paceefic Ocean. ↑ French owerseas territories in the Pacific Ocean anerly. ↑ CET applies tae Metropolitan Fraunce anly. Time zones athort the French Republic span frae UTC-10 (PF) tae UTC+12 (WF). ↑ CEST applies tae Metropolitan Fraunce anly. Nae aw overseas territories observe Daylicht Savin Time. ↑ The owerseas regions an collectivities form pairt o the French telephone nummerin plan, but hae thair awn kintra cawin codes: Guadeloupe +590; Martinique +596; French Guiana +594, Réunion an Mayotte +262; Saunt Pierre an Miquelon +508. The owerseas territories are nae pairt o the French telephone nummerin plan; thair kintra cawin codes are: New Caledon +687, French Polynesie +689; Wallis an Futuna +681. ↑ In addeetion tae .fr, several ither Internet TLDs are uised in French owerseas départements an territories: .re, .mq, .gp, .tf, .nc, .pf, .wf, .pm, .gf an .yt. Fraunce an aa uises .eu, shared wi ither members o the European Union. The .cat domain is uised in Catalan-speakin territories. 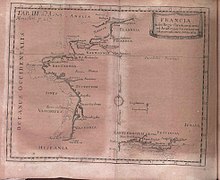 ↑ French Guiana is locatit in Sooth Americae; Guadeloupe an Martinique are in the Caribbean; an Réunion an Mayotte are in the Indian Ocean, off the coast o Africae. Aw five are conseedert integral pairts o the republic. Fraunce an aa comprises Saint Pierre an Miquelon in North Americae; Saunt Barthélemy an Saunt Martin in the Caribbean; French Polynesie, New Caledon, Wallis an Futuna an Clipperton Island in the Paceefic Ocean; an finally the French Soothren an Antarctic Launds. ↑ CIA (2015). 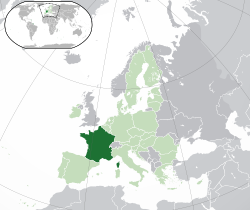 "The World Factbook: France". Retrieved 19 February 2016. ↑ 3.0 3.1 "The World Factbook – Field Listing – Area". CIA.gov. Central Intelligence Agency. Retrieved 1 November 2015. ↑ "France Métropolitaine". INSEE. 2011. ↑ 6.0 6.1 "France, World Economic Outlook Database, April 2016". International Monetary Fund. Retrieved 9 May 2016. ↑ "CIA World Factbook". CIA. Retrieved 16 April 2013. ↑ Hargreaves, Alan G., ed. (2005). Memory, Empire, and Postcolonialism: Legacies of French Colonialism. Lexington Books. p. 1. ISBN 978-0-7391-0821-5. ↑ "GDP (current US$)". Data.worldbank.org. The World Bank Group. Retrieved 1 November 2015. ↑ "GDP, PPP (current international $)". Data.worldbank.org. The World Bank Group. Retrieved 1 November 2015. ↑ "Global Wealth Report" (PDF). Credit Suisse. Retrieved 27 October 2014. "In euro and USD terms, the total wealth of French households is very sizeable. Although it has just 1% of the world's adults, France ranks fourth among nations in aggregate household wealth – behind China and just ahead of Germany. Europe as a whole accounts for 35% of the individuals in the global top 1%, but France itself contributes a quarter of the European contingent. ↑ "World Health Organization Assesses the World's Health Systems". World Health Organization. 8 December 2010. Retrieved 16 July 2011. ↑ "World Population Prospects – The 2006 Revision" (PDF). UN. Retrieved 27 April 2010. ↑ "Europa Official Site – France". EU. Retrieved 28 October 2014. ↑ "History of France". Discoverfrance.net. Retrieved 17 July 2011. ↑ Perry, Walter Copland (1857). The Franks, from Their First Appearance in History to the Death of King Pepin. London: Longman, Brown, Green, Longmans, and Roberts. ↑ Examples: "frank". American Heritage Dictionary. "frank". Webster's Third New International Dictionary. And so on. ↑ Michel Rouche (1987). "The Early Middle Ages in the West". In Paul Veyne. A History of Private Life: From Pagan Rome to Byzantium. Belknap Press. p. 425. ISBN 0-674-39974-9. OCLC 59830199. ↑ Tarassuk, Leonid; Blair, Claude (1982). The Complete Encyclopedia of Arms and Weapons: the most comprehensive reference work ever published on arms and airmour from prehistoric times to the present with over 1,250 illustrations. Simon & Schuster. p. 186. ISBN 0-671-42257-X. Retrieved 5 July 2011. ↑ The Cambridge ancient history. Cambridge University Press. 2000. p. 754. ISBN 978-0-521-08691-2. Retrieved 23 January 2011. ↑ Claude Orrieux (1999). A history of ancient Greece. John Wiley & Sons. p. 62. ISBN 978-0-631-20309-4. Retrieved 23 January 2011. ↑ "Provence in Stone". Life. 13 July 1953. p. 77. Retrieved 23 January 2011. ↑ "France". Berkley Center for Religion, Peace, and World Affairs. Archived frae the oreeginal on 6 February 2011. Retrieved 14 December 2011. See drop-down essay on "Religion and Politics until the French Revolution"
↑ "Treaty of Verdun". History.howstuffworks.com. 27 February 2008. Retrieved 17 July 2011. ↑ "History of France – The Capetian kings of France: AD 987–1328". Historyworld.net. Retrieved 21 July 2011. ↑ "Massacre of Saint Bartholomew's Day". Britannica.com. Retrieved 21 July 2011. ↑ "BBC History: Louis XV (1710–1774)". BBC. Retrieved 21 July 2011. ↑ "Scholarly bibliography by Colin Jones (2002)" (PDF). Archived frae the oreeginal (PDF) on 25 July 2011. Retrieved 21 July 2011. ↑ Dr Linton, Marisa. "The Terror in the French Revolution" (PDF). Kingston University. ↑ 46.0 46.1 Blanning, Tim (April 1998). "Napoleon and German identity". History Today. 48. London. ↑ "France's oldest WWI veteran dies". London: BBC News. 20 January 2008. ↑ "The Danish Center for Holocaust and Genocide Studies". Archived frae the oreeginal on 16 April 2014. ↑ "BBC, The Vichy Policy on Jewish Deportation". ↑ Kimmelman, Michael (4 March 2009). "In France, a War of Memories Over Memories of War". The New York Times. ↑ Crozier, Brian; Mansell, Gerard (July 1960). "France and Algeria". International Affairs. Blackwell Publishing. 36 (3): 310. doi:10.2307/2610008. JSTOR 2610008. ↑ From Fourth to Fifth Republic – University of Sunderland Archived 23 Mey 2008[Date mismatch] at the Wayback Machine. ↑ Hinnant, Lori; Adamson, Thomas (11 January 2015). "Officials: Paris Unity Rally Largest in French History". Associated Press. Archived frae the oreeginal on 11 January 2015. Retrieved 11 January 2015. ↑ "Paris attacks: Millions rally for unity in France". BBC News. 12 January 2015. Retrieved 12 January 2015. ↑ "Parisians throw open doors in wake of attacks, but Muslims fear repercussions". The Guardian. 14 November 2015. Retrieved 19 November 2015. ↑ Syeed, Nafeesa (15 November 2015). "Yes, Parisians are traumatised, but the spirit of resistance still lingers". The Irish Independent. Retrieved 19 November 2015. ↑ "Europe's open-border policy may become latest victim of terrorism". The Irish Times. 19 November 2015. Retrieved 19 November 2015. ↑ "Mont Blanc shrinks by 45 cm (17.72 in) in two years". Sydney Morning Herald. 6 November 2009. Retrieved 9 August 2010. ↑ "Ambassade de France au Canada – Le Coin des Enfants". ambafrance-ca.org. ↑ "Nuclear Power in France". World-nuclear.org. Retrieved 17 July 2011. ↑ "Energy profile of France". Eoearth.org. Retrieved 17 July 2011. ↑ "Forest area by country". Nationmaster.com. Retrieved 9 August 2010. ↑ "Parks.it – Parks and other protected areas in France". parks.it. This Fraunce-relatit airticle is a stub. Ye can help Wikipaedia bi expandin it.